The CMAST resident and rotating faculty are the heart and soul of the Center. 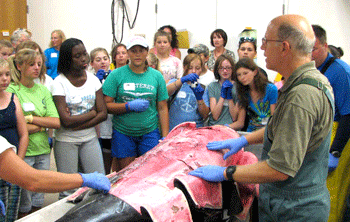 They maintain thriving labs, oversee undergraduate and graduate students, work closely with post-doctoral scholars and DVM residents, conduct research projects, teach NCSU classes from the coast via distance learning teleconferences, and more. 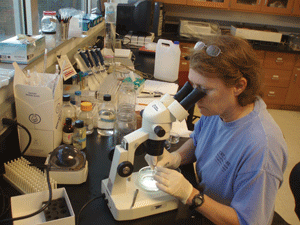 Craig A. Harms, D.V.M., Ph.D.
Dr. Pat McClellan-Green conducts research in her marine environmental toxicology lab.